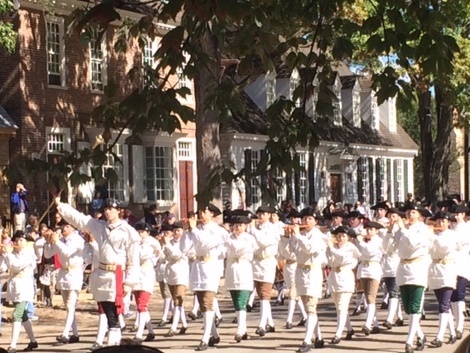 I recently spent a week at the restored town of Colonial Williamsburg. I learned more than I realized I wanted to know about the historic town that was so integral to the founding of our country. Without Doctor William Goodwin and John D. Rockefeller, Jr., it is doubtful the restoration of the colonial town would have been possible. Dr. Goodwin, former rector of Bruton Parish Church in Williamsburg and department head at the College of William & Mary, is credited with piquing Rockefeller’s interest in restoring the historic town to the point where he invested millions of dollars in the undertaking. We now have the benefit of going back in time and seeing what life was like in Colonial Williamsburg. As elementary students of Virginia learn, the House of Burgesses was located in the Capitol building at Williamsburg. Previously, the House of Burgesses had been located in Jamestown. Some of the most famous burgesses (elected representatives) were George Washington, Thomas Jefferson and Patrick Henry. 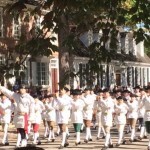 As any visitor to Williamsburg can attest, there are actors in period attire called “interpreters” who portray various well-known historical figures who were associated with the town in some way. I was able to observe and hear speeches by interpreters who played the roles of the Marquis de Lafayette, James Madison, Thomas Jefferson, Patrick Henry and George Washington. The interpreters who portray these individuals study their character in-depth. In Jefferson’s case, the interpreter has played his role for over twenty years. Over two hundred years later, do we often think about why the Revolutionary war was really fought, or for that matter, the Civil War or World War II? Truly, an educated population is the best defense against tyranny. We owe it to our Founding Fathers to educate our young people about why the Revolutionary War was fought and why the battle still continues for religious freedom both here and abroad. Our young people’s education must not be tainted by those who want to choose what parts of history are important. The complete history of our Founding Fathers must be told, including the gallantry and the humanness of their characters, not to exaggerate their accomplishments or tear them down, but for the sake of accuracy. When we read of Federalist John Adams and Anti-Federalist Thomas Jefferson’s friendship, we also read of their differences and their lack of correspondence for ten years after Jefferson defeated Adams for the Presidency in 1801. We read of their reconciliation, and strangely enough, both of them died on the same day, July 4, 1826. We have no doubt that both men loved their country and served it well. The Federalists never intended the government to grow into the huge bureaucracy it has become. The Anti-Federalists hoped the average citizen would love his country so much that he would hold the government accountable. The difference in our Founding Fathers and some of our present-day politicians is that our Founding Fathers truly cared about this nation and the ideas that made it great. Sadly, many politicians today do not love our country and don’t care whether our youth learn the truth about how this great country was founded. Thanks to the vision of men like Dr. Goodwin and Rockefeller, Jr., a small glimpse of what life was like in our Founding Fathers’ time can be seen in the historic town of Colonial Williamsburg. If you ever get the opportunity, I encourage you to “go back in time” and visit. You just might hear more references to God, the Creator and Providence than those who have sought to rewrite history want you to believe. As Thanksgiving Day draws closer, let us take time to thank God for our ancestors who fought and died for liberty, for our Founding Fathers who pledged their “lives, fortunes and sacred honor,”4 and for our Veterans who have continued in the tradition of patriotism so that we might enjoy freedom and instill in our children and grandchildren the values on which our country was founded.